Swarovski ‘s fourth SCS trilogy is the “Fabulous Creatures” series, which was in the late 1990’s era. The initial Fabulous Creatures crystal figurine is the Swarovski. All the crystal figurines in the “Fabulous Creatures” series are mythical creatures, making this series unique based on human interpretation, existing sculptures, or drawings, and not based on nature itself. The Swarovski Unicorn was available for purchase only in 1996 by collectors who had a membership in the Swarovski SCS Club. The Swarovski Unicorn measures about 4 1/4” long. It is a clear figurine with a long frosted spiraling horn, frosted goat’s beard, frosted mane, and frosted tail. The SCS Unicorn is lying on its stomach. The Fabulous Creatures Unicorn was known using the Swarovski identification numbers DO1X961 and 191 727. This SCS Unicorn contains what the crystal brand calls the ‘backstamp / bottomstamp’, which is included for the sake of authenticity. Since Martin Zendron was the designer, it is his initials “MZ” and the year “96” can be seen on the underside of the Unicorn . Having such a long and fragile protrusion, the Unicorn horn is the most common form of damage or breakage. We have seen or heard stories from a large number of clients who report the horn has come unglued, or a simple tap to it during cleaning has caused it to break off. Sadly, this is an expensive component for Swarovski restoration experts to replace. Oftentimes, the cost is close to that of purchasing a replacement Swarovski Unicorn in mint condition. The crystal brand has produced one other Unicorn other than the 1996 SCS Unicorn. This other Swarovski Unicorn was part of their Silver Crystal product line. This Unicorn is standing on all 4 legs and has a short horn. 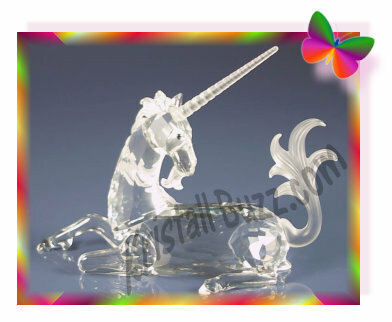 The identification # for this Swarovski Unicorn are 7550 000 013 / 630 119. It was produced 2004 through 2009 at a retail price of $300. The SCS Swarovski Unicorn retailed for $325 USD in 1996. The purchase price included the crystal figurine, a custom box for the figurine, and a Swarovski COA (certificate of authenticity). While the resale price of the Swarovski Unicorn surpassed to nearly $700 shortly after 2000, a mint condition figurine, complete with original packaging can generally be purchased on the secondary market for original MSRP, from Swarovski expert dealers, like Crystal Exchange America. Swarovski introduced a cute Kris Bear figurine holding his skis and poles in 1999. The official name of the crystal figurine is “Kris Bear with Skis”. The Swarovski Kris Bear with Skis was produced with 2 different variations, but both recognized with the same Swarovski part number 7637 000 004 and system numbers 234 710. Kris Bear with Skis was designed by Martin Zendron, and it retailed for $85. While the Kris Bear tradition continues, the Kris Bear with Skis figurine was ultimately retired in 2004. Swarovski crystal fanatics are probably asking about the history and reasoning of the variations on the Kris Bear with Skis figurines. Viewing the picture, collectors can see that the figurine with the crystal disc base is likely to be more stable and less likely to tip over. It is widely believed that this is the reason that the base was added to the Swarovski Kris Bear with Skis figurine. So how long was the variation without the base produced? The production time or quantity is unknown. The theory is that the unsteadiness was discovered fairly early, and the ones without the base may have been samples for Swarovski representatives to take to the retail stores and the remainder of the first bulk production ended up on store shelves. One thing for sure, the Kris Bear with Skis (no base) is a Swarovski HTF figurine, and it does command higher prices on the secondary market. When crystal figurines appear on the market in multiple variations, collectors sometimes wonder about authenticity and counterfeiting. Both variations of the Kris Bear with Skis would not likely be counterfeited simply by removing/adding a base. This is because of the location of the Swarovski Swan logo on the figurine. For the variation without the base, the swan logo is directly on the foot. For the variation with the base, the swan logo is on the base. Taking a crystal figurine, and carefully removing the base would result in a figurine without the swan logo at all. For this particular Swarovski figurine, a Kris Bear with Skis (no base variation), this should raise a BIG RED FLAG as being altered (base removed). If I were to purchase the Swarovski Kris Bear with figurines for myself or as a gift, I would select the one with the base. I would not want one that would be more likely to tip over and break, complicated by the fact that it would be more difficult to replace. If you are looking for any of the retired Kris Bear crystal figurines, Crystal Exchange America has nearly 70 available for purchase. Swarovski Kris Bear figurines. They can be found in the “Other Silver Crystal” category, “Toys” subcategory.